...We'll reward you with a free Ice Cream! If you’re looking to hire an Ice Cream Van for your event or for any other reason then Piccadilly Whip are here to help you. We’ve been operating our fleet of Ice Cream vans for over 50 years throughout London and the South-East of England. 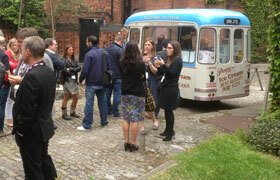 Have one of our classic Ice Cream vans at your wedding or party. Would you like to treat your staff to an Ice cream? Use our innovative Ice Cream Express service. Call us and we will arrange for one or more of our vans to come to your premises, and we’ll then provide all of your staff with an ice cream of their choice. We offer competitive pricing and packages – please get in touch.